Even when they're just giving fans some glorified repaints, the GI Joe Generation 3 comic packs still offer some pretty cool figure selections. 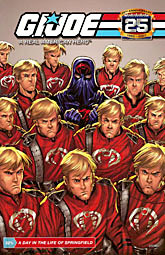 The Crimson Guard are elite Cobra troopers with degrees in law or accounting in addition to their Cobra combat training, Each "Siegie" undergoes plastic surgery, so that every trooper looks exactly alike, and each one is known as "Fred" to further enhance the group's uniformity and anonymity. After the surgery, they are given new lives in new cities, where they are expected to blend in and become valued members of that community, climbing political and corporate ladders into positions of power and influence. Topping off the uniform is the Siegie's distinctive helmet. Just most of the Cobra personnel, the Crimson Guards' identity was obscured by a concealing mask - making them excellent army builders. The headgear can be removed to reveal the face of a Fred beneath. I guess. Despite what the file card says, not all the Siegies were in "the Fred series" - there were actually several different "models," and Fred was just one of them. The particular problem with this figure is his hair color: the Freds were all redheads, while this guy is a dusty blonde. He'd better go see his stylist to get his dye-job touched up before Cobra Commander sees him in this sorry state! The Crimson Guard has a few updated accessories, such as the V-shaped backpack. It looks like a hardbody backpack, possibly even providing a bit of armor back there. The clasp is a Cobra symbol, because Cobra Commander is all about branding. The figure's main weapon is a brown M-1 Garand rifle, detailed machine gun with a serrated bayonet affixed to the end, but he also has an old-fashioned revolver on his hip. In 1985, that pistol was a sculpted part of the figure, while today it's its own piece. Ah, progress! The Cobra organization has legions of troopers who perform the basic, day-to-day functions of a secretive, quasi-military organization. They are expected to be loyal and obedient no matter what their function, whether it's battling the GI Joe team as a frontline trooper or chauffeuring Cobra Commander, as is the job of this scar-faced Cobra officer, whose facial disfigurement tells a tale of a dark and dangerous past. Like most Cobra officers, he was probably a criminal or mercenary before joining Cobra as an infantry trooper then working his way up the ranks. The Scarred Cobra Officer - "Scar-Face" to those who know him - originally appeared in GI Joe #12, and was a pretty big part of the story for a while there. He was running all over the globe as a courier, and the Joes were on his trail the whole time. Why was he used so much? Because he was identifiable: yes, he wore the same bandana facemask as all the other troopers, but the scar over his eyes was still visible. 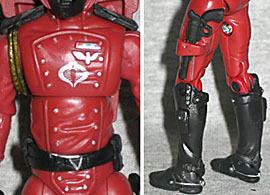 For the most part, Scar-Face is the same figure as the Cobra Air Trooper: a very detailed update of the classic Cobra uniform, a solid blue outfit with black boots and gloves, tan kneepads and belts, and red Cobra symbols on his chest and left arm. 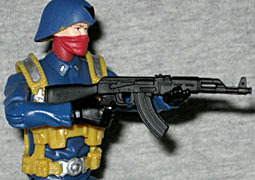 His webgear (a removable piece, tan with silver highlights) is the same worn by the Cobra Officer, rather than the usual Troopers, and his identity-concealing bandana is red, rather than black. Pop off the standard helmet and Scar-Face has a surprise in store: he's the first Cobra Trooper to have hair! It's not sculpted - they've just painted his bald head brown - but it's still a nice addition. And of course, they've also molded his little scar; it could probably have used some darker paint to make it stand out (it's pink, right now), but it's there. Scar-Face is armed with a black AK-47, a new mold, and the same silver dagger on his thigh as the rest of his brothers. The first few TFAC comic packs presented old Marvel Comics with new covers - but this new assortment tries something new. The comic included here is #32½. Yes, that means it's specifically designed to go between #32 and #33. And in order to maintain the continuity of the original story, they got the original writer: this is a brand-new Larry Hama GI Joe story, and that's always a good thing. The story, "A Day in the Life of Springfield," shows us what goes on in Cobra's own little Levittown when GI Joe isn't invading. The writing is good (among other things, we learn Dr. Mindbender's origin), but the art is... not as good. The artist isn't credited anywhere in the book (research reveals it's Jeremy Dale), but he seems to be trying to channel Todd Nauck. Poorly. It's not that the art is necessarily bad, just that it seems out of place. Rushed. Oh, and one note about the story: since it's included with Scar-Face and a Crimson Guard, you'd expect them to be featured, right? Not a Crimson Guard in sight - at least, not any who are identified as such. Scar-Face is pretty prominent, despite the fact that he died in GI Joe #19. Yes, 13½ issues before this story is set. What do you want? It's been 22 years since Hama wrote all that: I think we can forgive him for missing a detail or two. Besides, it's not like clones are unknown in the GI Joe universe.